I knew that once I became pregnant I wanted to document it in some way, to have something to look back on and remember the small things. So I am committing to a weekly bumpdate. My goal is to make Thursdays the day, we'll see how that goes, but I tend to do better with goals/deadlines, so hopefully this will work for me! As you know I hate getting in front of the camera, but here we go! Total Weight Gain| I think I'm up about 5 pounds. Honestly I was terrified to weigh myself for the longest time, so I waited until I had my first appointment. Because of that I don't know exactly where I started. I am barely showing at all, but I definitely can feel it! I'm thicker around the middle, and I think the hips are feeling it too. Gender| ??? We will have to wait until closer to 20 weeks to find out, but we will most certainly find out. Symptoms| I think I've been super lucky in this department. My acupuncturist said that most people who are using acupuncture don't suffer from morning sickness, whether that's accurate or not I've been lucky to not have anything more then a kind of icky or nauseous feeling here and there. I have been pretty tired by the end of the day, and napping on the weekends, though I'm feeling less tired this week then I have in several. But mostly I'm just hungry ALL THE TIME! Which definitely makes me terrified that that total weight gain is going to shoot right up! Cravings| Mostly comfort foods, but really it feels like everything I can't/shouldn't be eating! Like sugar and carbs, all I want cereal and toast. Really I don't think I could get enough toast, but I have to watch my carbs and sugar because of my PCOS I'm at higher risk for developing gestational diabetes, which I definitely don't want to do. Sleep| Pretty decent. I can still sleep comfortably in all the positions that I'm used to, now I can just expect a bathroom break between 4 - 6 am, which sometimes I have quite a hard time falling back asleep afterwards, and it's definitely not from a lack of being tired. 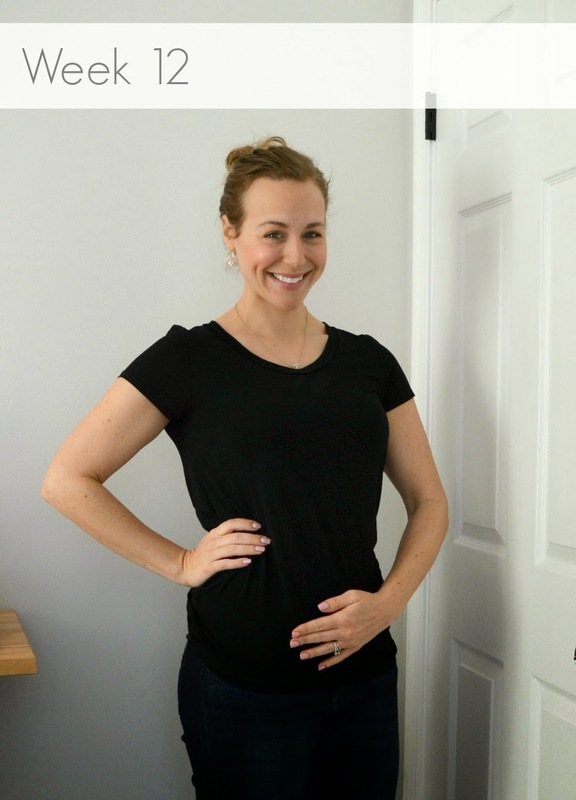 Clothes| I'm still just wearing all my regular clothes, but I find myself gravitating towards lose flowing tops, and my work pants are starting to get pretty uncomfortable, I've started to use a belly band with them which is better. I've begun to look for some maternity clothes, mostly pants, and well I've always hated shopping for pants, and this isn't really an exception, we will see what I find. Any recommendation are greatly appreciated! Workouts| I'm trying. I'm lucky if I average 2 - 3 days a week right now, mainly because I've been so tired. I try to get some time logged on the elliptical and a few light weights. I want to try to stay as healthy as I can throughout this pregnancy, so I'm hoping as I move into the second trimester and gain back some energy I can get more consistent with my workouts. Nursery| I won't get started on this for some time, but in the mean time I'm hitting Pinterest for some great inspiration. But I am super excited to put this room together! Movement| I don't anticipate I'll be feeling anything for many weeks to come, but at our 12 week appointment we got to see our little one sucking their thumb and rolling around. Best Moment this Week| Besides our ultrasound, because it's always refreshing to see a healthy baby moving around. I came home from work SO hungry one day, but so completely exhausted at the same time and I opened the fridge to find Martin had made me a bowl of fruit and a cheese quesadilla and I literally praised him out loud, I was so grateful for that food! There you have it, those are my stats so far! Awww....love this! Glad things are going well for you! You really look fabulous in the pic...you honestly do have that "glowing" look! CONGRATS again! So excited to go through this together! I love this! You look absolutely fabulous! Can't wait to follow along your journey! Can I chalk up that "glowing" look to good blush? :) So glad I get to go through this with you! Thanks Lisa! I've really been feeling pretty great, can't complain! Thanks so much for stopping by Stephanie. Congratulations on your new addition! I definitely like to see what others experience too! It sounds like everything is going well so far! I can't wait to see how everything progresses - you look so happy in your photo! Beautiful!!!! :) So happy for you. Pro tip: put a night light in your bathroom, so you don't have to turn on the lights when you wake up for your middle of the night bathroom trips. It helped me fall back asleep so much faster! So far so good, I cross my fingers we have no major hiccups! Thanks, it's fun to get to share! That's a great tip! Only probably is, I don't even turn on the light right now, let alone barely open my eyes and I still can't fall asleep! !